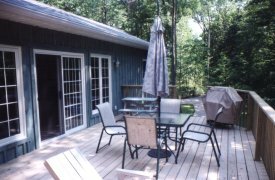 NEW Lakeview Secluded Spacious Bungalow: Over 1200 sq. ft., board-and-batten cottage completed in June, 2002. Ten minutes north of Goderich. Features cathedral ceilings, skylights, laminate wood floors, fireplace, two decks accessed by patio doors, covered porch, designer kitchen, two full baths. 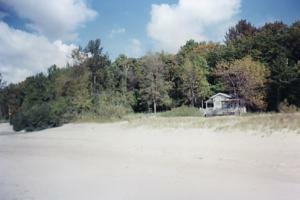 Large, secluded wooded lot overlooking wide, private, sandy beach. Use beachhouse deck which offers shade, sun, lounge chairs, and is situated on sand. 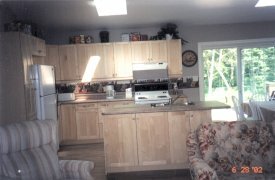 Great swimming, fishing, nature walks, proximity to golf courses, and local summer theatres. Horseshoes, beach volleyball and firepit. Waterfront Cottage above with Beachhouse below. Brand new facilities. Two bedrooms each have a Queen size bed. Third bedroom has a bunk unit with one double and one single bed. Please bring your own linens, towels, and soaps. 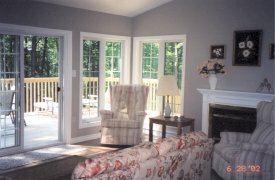 Muskoka chairs, lounges, patio furniture.